When treated with N-bromosuccinimide (NBS) and light (hν) alkyl group adjacent to aromatic groups will be converted to into alkyl bromides. This reaction is analogous to allylic bromination of alkenes. 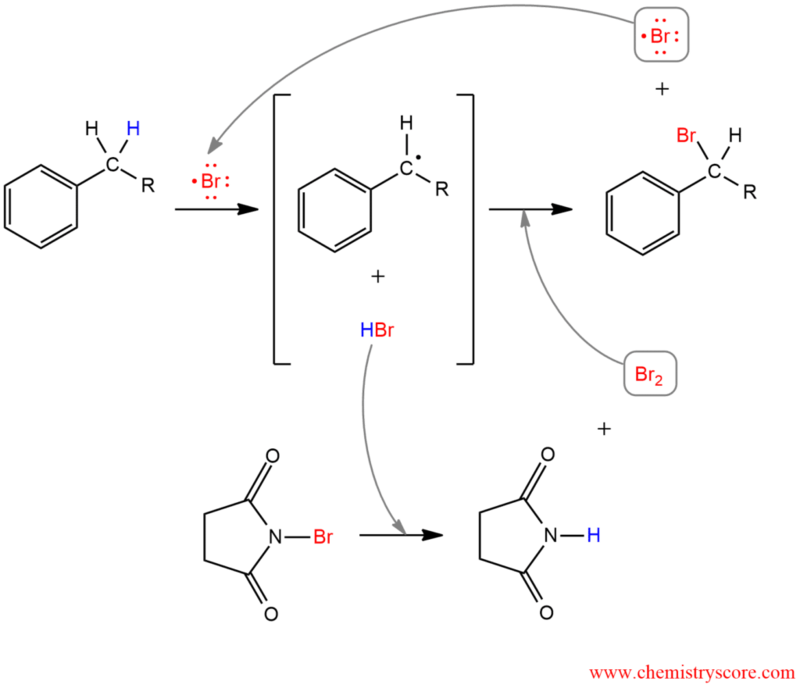 Bromination occurs exclusively next to the aromatic ring so this reaction is called a Side Chain reaction. The benzene ring remains unchanged but at the benzylic position which is the most reactive position comes to introduce the bromine via the free radical mechanism. Like a source of bromine is used N-bromosuccinimide (NBS) but for reaction, we need a trace amount of bromine and because NBS is the right choice. In the first step, initial step, NBS treated with light (hν) or heat (Δ) produces Br radical which in the next step (propagation step) abstracts of benzylic hydrogen generated an intermediate benzylic radical. This radical intermediate is stabilized by resonance so does not give a mixture of products. Then the benzyl radical reacts with Br2 to yield product and a Br radical which cycles back into the reaction to carry on the chain reaction. Molecular bromine is produced when HBr reacts with NBS.